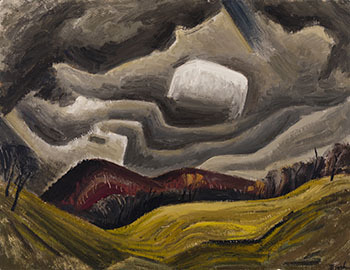 Jack Bush's landscapes of the 1930s and 1940s were influenced by Charles Comfort and the Group of Seven. However, after encountering Abstract Expressionism during a 1950 trip to New York, Bush experimented with abstraction, and for a time moved back and forth between figuration and abstraction. The year 1953 was a pivotal one for Bush - he participated in the exhibition Abstracts at Home in Toronto with a group of modernist artists, who afterwards became Painters Eleven. Abstraction would dominate Bush's work by 1955, but in 1953 he was still painting landscape. Marc Mayer's description of one of Bush's styles as "perspectival distortion with increasingly expressionist angularity" is an apt one for this strong landscape. There is a jagged rhythm and coiled tension to the rolling land and folding layers of clouds, and the central grey-white square form hovers in the clouds like an abstracted motif. In Small Red Hill, Bush has left behind the conventionality of his earlier work for a new and powerful expressionist interpretation of the landscape, which contains intimations of his movement towards abstraction.